Down syndrome is a naturally occurring chromosomal arrangement that has always existed. It occurs in all races, genders, geographic areas and in all walks of life. People with Down syndrome look like and share characteristics of family members and also share physical characteristics with their peers who have Down syndrome. People with Down syndrome have their own unique personality, temperament, capabilities, likes, dislikes and talents. All individuals with Down syndrome will have some degree of intellectual disability, however there is a wide variation in cognative abilities, behavior and physical development. Today early infant stimulation programs and improved educational opportunities enhance a person’s prospects for the future. People with Down syndrome learn at different rates and benefit from inclusive classroom settings just like their peers. 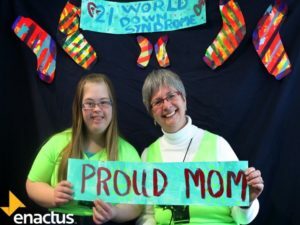 In adulthood, some individuals with Down syndrome will live independently; most individuals with Down syndrome will continue to require daily support in their home environment. Increasingly children with Down syndrome are performing at levels undreamed of in the past. Many children are graduating from high school, gaining job skills, attending post-secondary institutions, and finding meaningful employment. Many individuals with Down syndrome form meaningful relationships and get married. People with Down syndrome enjoy recreational opportunities in their communities and can excel in sports, music, drama and the arts. Heart defects are found in 30% – 50% of individuals with Down syndrome and 8% – 12% have gastrointestinal tract abnormalities present at birth. Most of these defects are now correctable by surgery. Life expectancy of an individual with Down syndrome is reduced, however 80% of individuals will live to age 55. One of the main causes of a reduced life expectancy is the high rate of early-onset Alzheimer’s disease for individuals with Down syndrome. Down syndrome is not the whole person – it is just a part of who they are.